World Airways brings Operation Babylift adoptees to Vietnam for Homeland Tour and reunion. The entire group of adoptees and company executives gathered on the ramp before takeoff from Oakland International Airport in front of the specially painted World Airways MD-11 in 1975 livery. Cheers and tears accompanied Operation Babylift - Homeward Bound through its entire voyage in June 2005, from lift-off in Atlanta to arrival in Ho Chi Minh City, and back. After months of planning and preparation, 21 Vietnamese-American adoptees became the guests of World Airways for a whirlwind visit to their homeland, Vietnam. 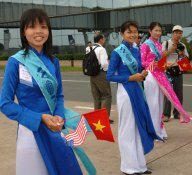 Ho Chi Minh City officials provided a festive welcome, complete with banners, flags and costumed greeters wearing World Airways sashes. Many of the adoptees watched out the aircraft windows with anticipation and anxiety as they saw the ground come closer on the approach to Tan Son Nhut Airport. The special ceremonies brought tears and smiles for the adoptees, former World Airways employees and other guests in attendance. The entourage was treated to Vietnamese music and dancing and a special Lion Dance outside the terminal following speeches by a city official and CEO Randy Martinez. 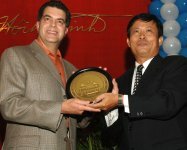 World received a decorative Ho Chi Minh City plate and presented a framed photograph of the aircraft painted for this special trip. Dignitaries honored World Airways by attending the gala dinner in the Unification Palace on the last night of the visit, after a day of touring and shopping. The U.S. Consul General and several staff members also participated. 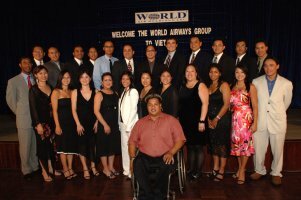 The trip began with a memorable gathering in San Francisco, where the adoptees, World Airways employees and World alumni gathered to hug, exchange stories and celebrate the memory of some of World Airways' historic accomplishments. Martinez thanked the alumni for their past contributions, which were a significant legacy leading to today's successful business operations. "No other airline has an opportunity like this, to celebrate such a wonderful legacy," Martinez said. "This is yet another chapter in the illustrious history of our company." Front-page stories told the history of World Airways and the role the company was playing now for 21 adoptees, representing approximately 3,000 Vietnamese children who were helped by the month-long Operation Babylift in April 1975. Former employees were a key part of the emotional reunion. Pilots Ken Healy and Bill Keating, flight attendants Jan Wollett and Atsuko Schlesinger, and ground staff Joe Hrezo, Thao Nguyen and Phung Nguyen represented those in Saigon who made the flight a reality. Ron Hunnicutt, who was among the flight attendants who joined the original Operation Babylift flight from Japan to Oakland, also was onboard representing In-Flight Services. Several of the cabin crewmembers on this trip also had worked Operation Babylift flights during April of 1975. Some of the most memorable experiences came from the visit to Phu My Orphanage, where World Airways presented a $5,000 check to benefit the children, many of whom were handicapped or required special care. Many of the adoptees and guests brought candy, crayons, markers, clothing, toys and other gifts to share with the children. Two of the adoptees came to the United States in 1975 from that same orphanage, which brought tearful moments of reflection.